Shop Lean-To Greenhouses from Gothic Arch Greenhouses !! 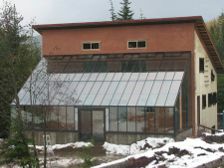 A lean-to greenhouse is attached to an existing structure, such as your home or garage. The attached greenhouse allows you direct access to your plants from the building you attach to. Sometimes it is easier to access utilities such as gas lines, plumbing, and electrical when the greenhouse structure is attached to your home. Aluminum Lean-To Greenhouse A Lean-to Greenhouse is a beautiful and serious growing environment attached to the side of a home or other structure. Extend your growing season with an Aluminum Lean-To Greenhouse. AC Garden Lean-To GreenhouseMade from the same exceptional materials and superiority of design as our free-standing greenhouses, the AC Garden Series Lean-to gives you easy access to all necessary utilities. This convenient, highly attractive greenhouse may be the perfect choice for you. There are nine models, available in many models, available in many lengths and widths. GH Lean-To Greenhouse The unique style of a straight Cape Cod style backyard greenhouse adds character to any landscape setting. Available in straight eave single and insulated double glass. 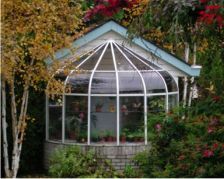 All glass is tempered safety glass for your peace of mind Tinting and other high performance glass options are available .Cape Cod style glass greenhouses are often used as conservatory, tea room or a small sitting area. Pacific Lean-To GreenhouseEnjoy the easy access and extended gardening season with the curved eave, home-attached Pacific greenhouse. Often referred to as a Lean-To or solarium, home-attached models offer guaranteed savings in heating costs. This greenhouse features a heavy-duty aluminum frame. Traditional Lean-To Greenhouses offers Extend the gardening season in a conveniently located home-attached Traditional greenhouse, easily adaptable to fit your home. Sometimes referred to as Lean-To or sunroom our home-attached models offer guaranteed savings in heating costs. This greenhouse features a heavy-duty aluminum frame. BIO Start Lean-to The BIO Start lean-to Greenhouse is the perfect Season Extender and beginner greenhouse. Originally designed for the English market these are now available in the USA.